In late March, 2019, we joined an Explore! 12-day photographic trip to Sri Lanka. It was a general trip designed to cover many subjects, including a couple of wildlife parks, but also many cultural subjects. 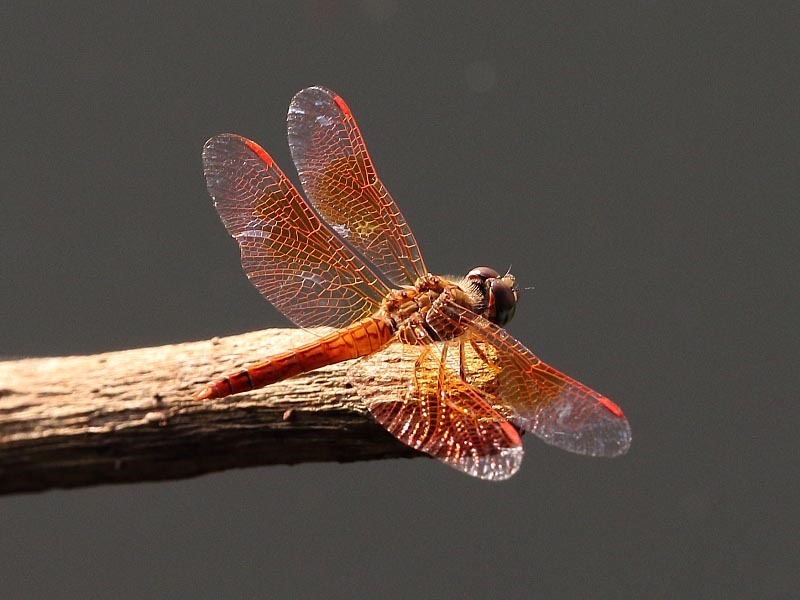 No specific odonata habitat was on the menu but I acquired a copy of A Field Guide to the Dragonflies and Damselflies of Sri Lanka (by Amila Prasanna Sumanapala) and packed photographic equipment in the hope that opportunities would arise as we travelled around. Sri Lanka has a rich collection of odos, 129 identified species of which some 49 are endemic, so I had no shortage of target species. Naturally, for many of these, specific habitats would have to be targeted and, with most stops being for a single night only followed by much of the day travelling, that was not going to be possible. 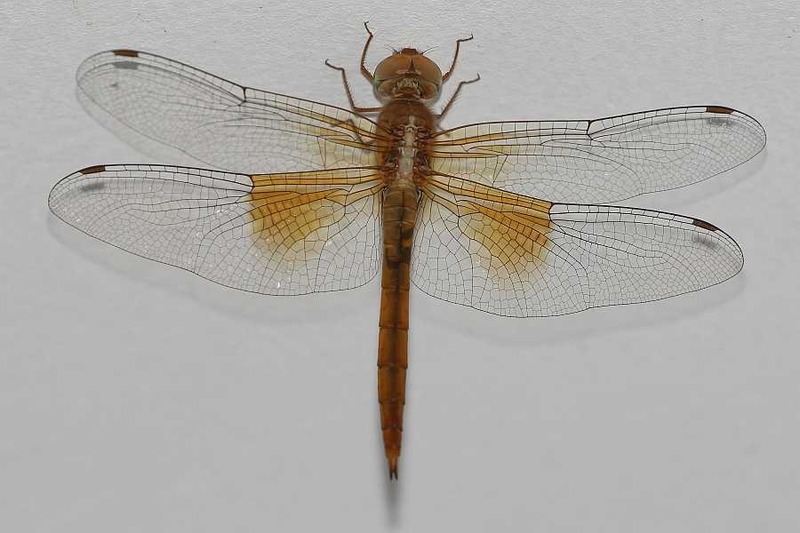 Nonetheless, though we didn’t encounter huge numbers of odonata, I did come away with a haul of 22 species including 9 “lifers” [shown in bold below], three of which were Sri Lankan endemics. In some respects this really only scratches the surface of Sri Lanka’s species but, given the ad hoc nature of my opportunities, I was quite happy. The Sri Lankan people were fantastic and it would certainly warrant a repeat visit. The common names used in Sri Lanka tend to differ from some common names I had become familiar with in other Asian locations where the same species may occur. Here I have used the common names assigned by the Sri Lankan publication mentioned above. Here’s my map of locations relating to the narrative following. Having arrived and stayed our first night at Negombo, just north of Colombo airport, our itinerary began by heading for Wilpattu National Park. Our route took us into Kurunegala for, first a coffee stop and, a little later following a side trip to a temple (the first of several), a longer lunch stop. The cafe/restaurant stood right beside Kurunegala Lake where a man was harvesting lotus plants. In and around the shallower margins of the lake I notched up five species including three lifers, though I didn’t realize at the time, so this was a great start. Two were old friends from our Singapore/Cambodia trips. Our first major stop was to spend two days on safari in Wilpattu travelling in 4x4s. Wilpattu is home to elephant, leopards and crocodile so, quite naturally, officials are not keen on visitors getting out of their vehicles – if it happens, the vehicles get banned. 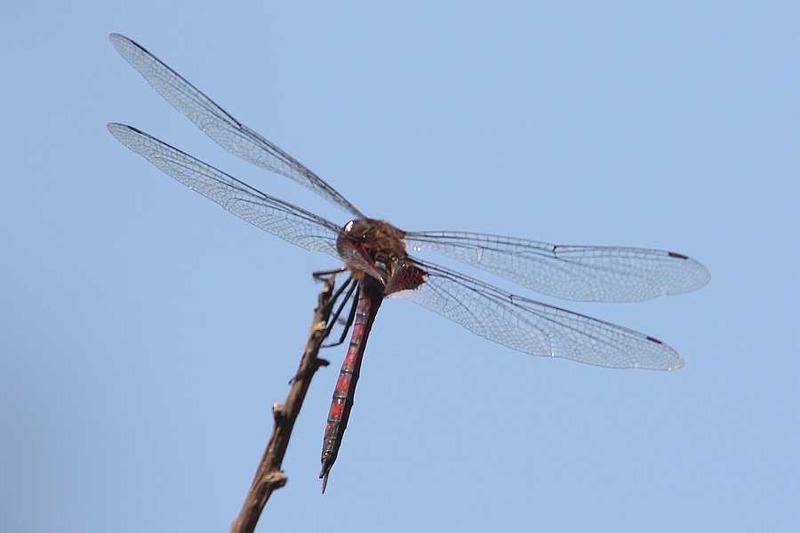 During our excursions, we managed to spot six species, some from the safety of our jeep but some also at a bona fide picnic spot beside a lake. To simplify many distinct GPS locations, I’ve grouped all the Wilpattu sightings together under one heading. 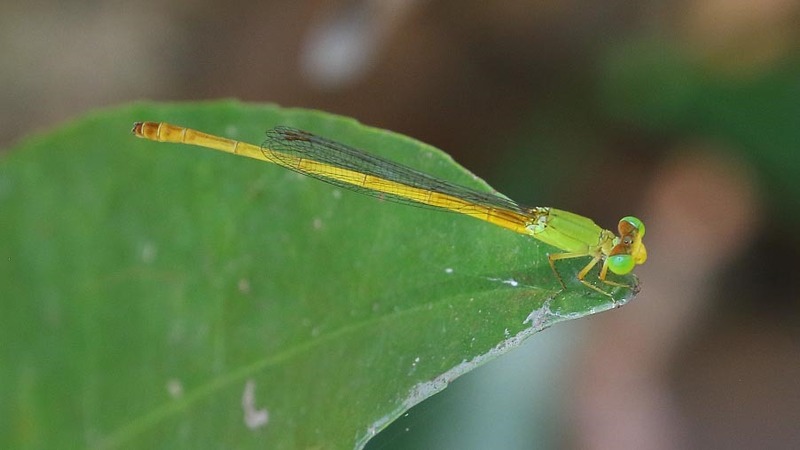 This list includes another two lifers, one of which was the first damselfly, Ceriagrion coromandelium (Yellow Waxtail). Again, initially, I thought the Tramea species was an old acquaintance until I noticed my suspect wasn’t recorded in Sri Lanka so this was a new one for the collection, Tramea limbata (Sociable Glider). After the second morning in Wilpattu we headed off to Anuradhpura and the Lakeside Hotel. Lakeside sounded promising but when I saw the lake it looked less promising, being very large. I did make two visits to a couple of different spots on its edge, both close to the hotel, and notched up eight species. I added a ninth when I returned to the hotel and found a Tholymis tillarga (Foggy-winged Twister) female in one of the hotel corridors. 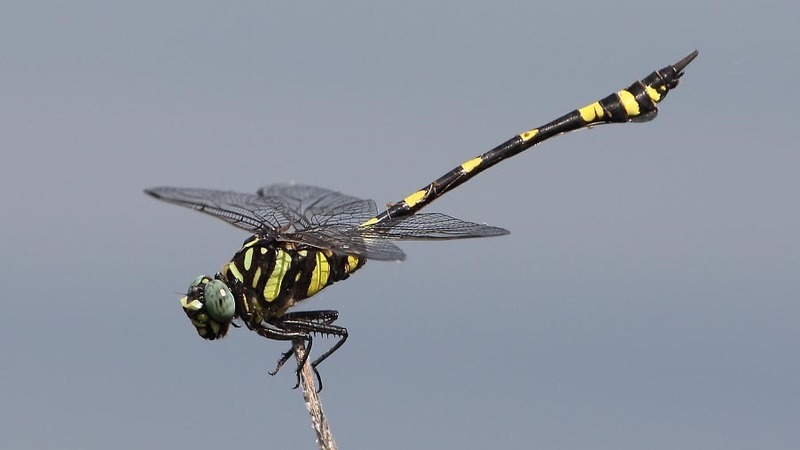 Now is a good time to mention a confusion regarding the Ictinogomphus I’d been seeing. 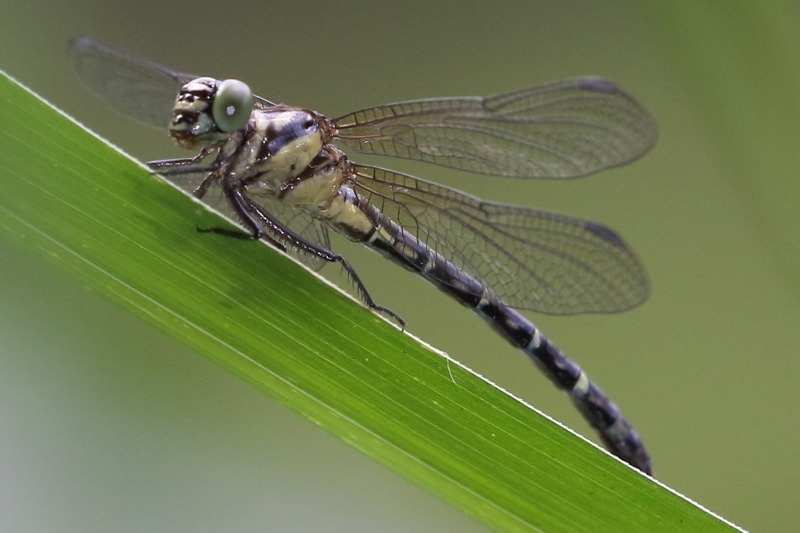 We first encountered them in Sri Lanka at Kurunegala Lake [#1 above] and I thought/assumed that I was looking at Ictinogomphus decoratus (Common Flangetail), which I’d met in Singapore and Cambodia. This character looked superficially the same, to my then untrained eye. Only when I bothered to check in a small field guide, did I notice that I. decoratus was not recorded in Sri Lanka and that this must’ve been the very similar looking I. rapax (Rapacious Flangetail). I struggled to find any description as the differences but have since been given a copy of a recent paper from India containing an explanation. Here’s my comparison diagram for those who care. Here was a day the main purpose of which was to visit not one but two Buddhist temples. At the first I chose to remain outside, keeping my shoes and SPF 50 hat on, where, mercifully, there was a small rock pool that produced three species. Included in these were the very exciting, though not excitingly coloured, Bradinopyga geminata (Indian Rockdweller or Granite Ghost in India) with, swarming above, clouds of Rhyothemis variegata (Variegated Flutterer), both being additional lifers. A little lower than my surprising rockpool, the trees contained examples of Potamarcha congener (Blue Pursuer), including a female, and a settled Tramea limbata (Sociable glider). This was a suburb of Kandy, where our premium accommodation in the Mahaweli Reach Hotel was located. The “reach” involved is a stretch of river. It was actually a very wide river but there appeared to be some decent habitat at the sides. We did see three species (plus an unidentified damselfly) but access was so restricted that no there was little hope of any decent pictures, which was a shame because several males of male Tholymis tillarga (Foggy-winged Twister) were flying about. 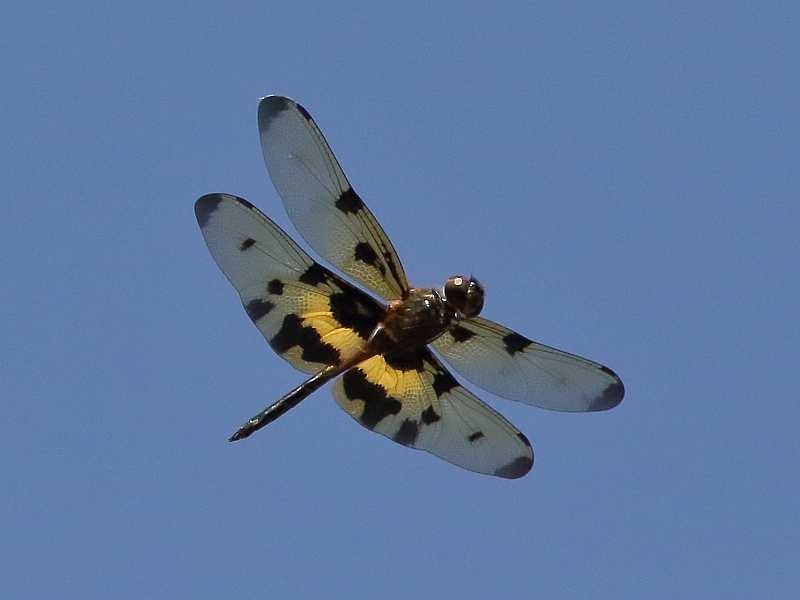 My best chance was of Brachythemis contaminata (Asian Groundling) from the hotel boat dock. A chance meeting with a single individual when we stopped for a photographic opportunity at this waterfall. I include it for the sake of completeness, though having said that it is a very good looking female specimen. This is a tea plantation where we were blessed with a 2-night stop. It was beside a large reservoir which looked quite low and very sterile – no emergent vegetation at all. A photo shoot with four tea pickers had been arranged after which I was delighted to find a small stream running down the tea slopes ultimately into the reservoir. The stream was very narrow and could be stepped over without getting feet wet. Small though it was, it produced three species including another lifer and Sri Lankan endemic, Elattoneura centralis (Sri Lanka Dark-glittering Threadtail). 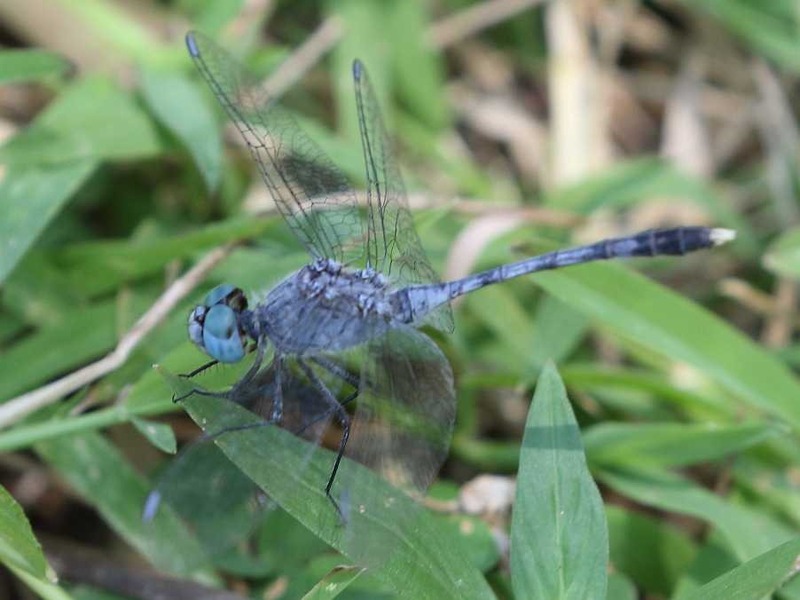 The more familiar species were very welcome, too, being only my second encounter with both Trithemis festiva (Indigo Dropwing) and Orthetrum glaucum (Asian Skimmer). Excellent! Another stay beside a river made me very hopeful. This time I was not disappointed, the river was a manageable size though slightly forested along its banks. Our camp (and the room was, indeed, partly tent) was right on top of it. The water was quite swift but the bed was gravel and it was shallow enough for me to walk through in water- tolerant shoes so I could gain access to the wilder side opposite. There were two stars here;two Sri Lanka endemics. 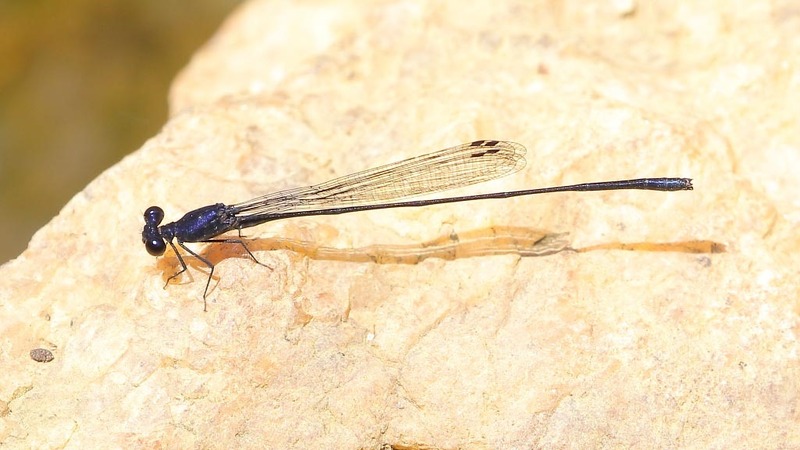 The first was the Demoiselle-like Euphaea splendens (Sri Lanka Shining Gossamerwing) of which, regrettably, I messed up the photo – it’s useable but only just. 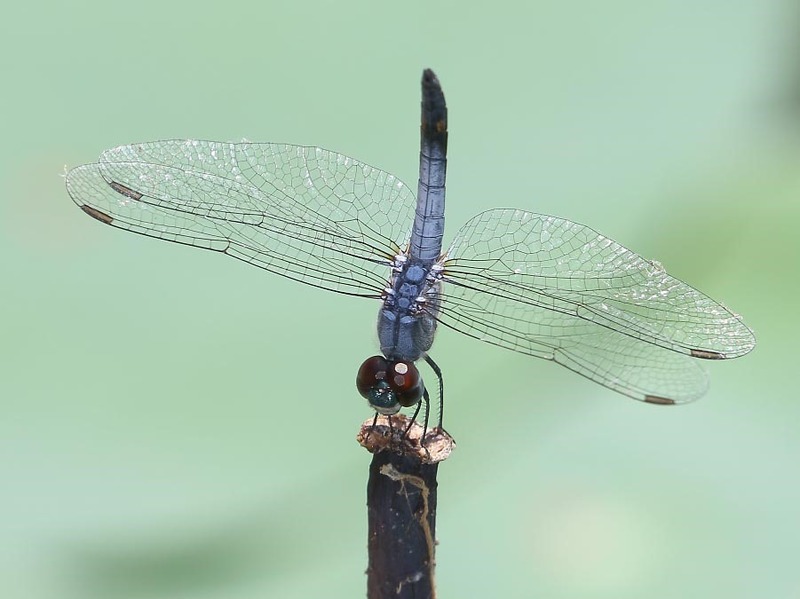 The second, for which I had to work very hard given its inaccessibility, was clearly a Gomphid and turned out to be the endangered Microgomphus wijaya (Sri Lanka Wijaya’s Scissortail). Very happy camper, apart from the messed up photo, and a great note to end on. 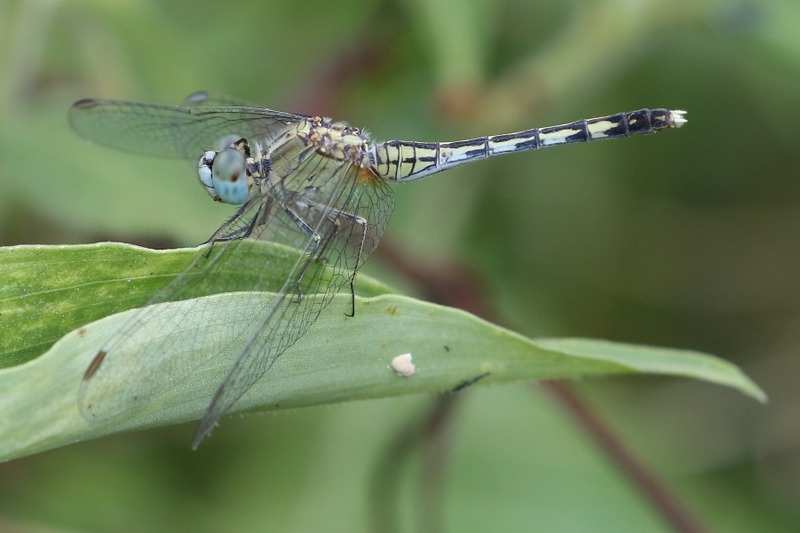 I had first misidentified my Orthetrum at the Farm Resorts, Dickoya, as O. luzonicum. It was, in fact, O. glaucum which I had previously encountered in Hong Kong 2017.